Looks pretty good thus far. The building looks a little odd, with the rust stain originating from seemingly nowhere. Are you going to run some pipe or wiring or somthing above that to act as a source of the rust? It looks nice though, and I suspect that once you get the rest of the details built and it placed on site it will look very nice. 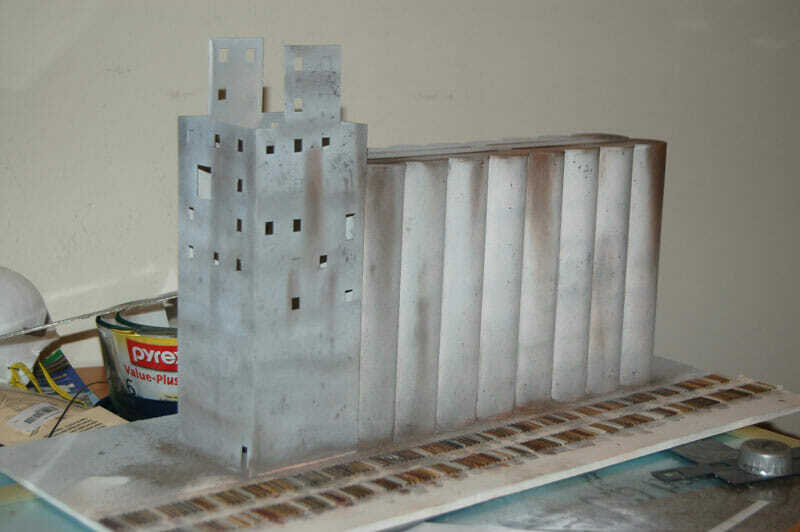 What are you using for the weathering? I generally use washes of paint, but I have seen tutorials of people placing oil paints where the stain originates, then thinning them with turpentine and dragging the color down into runs. It makes a really neat effect, but I have not yet tried it. Also, there are weathering powders that one applies almost like blush or eyeshadow (powder with a sponge) that are really nice for adding a dry, dusty look or a caked mud look. I just picked some up and used them on some tank models, and the effect is very quick and pleasing. And the track... yea... I hope you were watching a movie or something during all that time. Madness! The crossover looks fantastic. I would have been sure that was HO if you hadn't said N earlier. I never try to weather anything without some reference pictures. When left to my own imagination, it always ends up in the "Why haven't they scrapped this yet?" category. If any of you rr modelers find yourselves in northern Colorado, make a point of stopping by. You won't regret the time taken.